In this article we are going to cover the main entity around which the entire test case management tool is designed and working. When an authorized user has opted to add a test case, then a form to enter new test case information will be shown. To provide the properties (format) for text being used for each step user will have set of icons associated with the text editor. All the information collectively helps the tester to map out, how a part of a process should behave when executed. Here Suite, Title, and Priority of test case are mandatory fields. 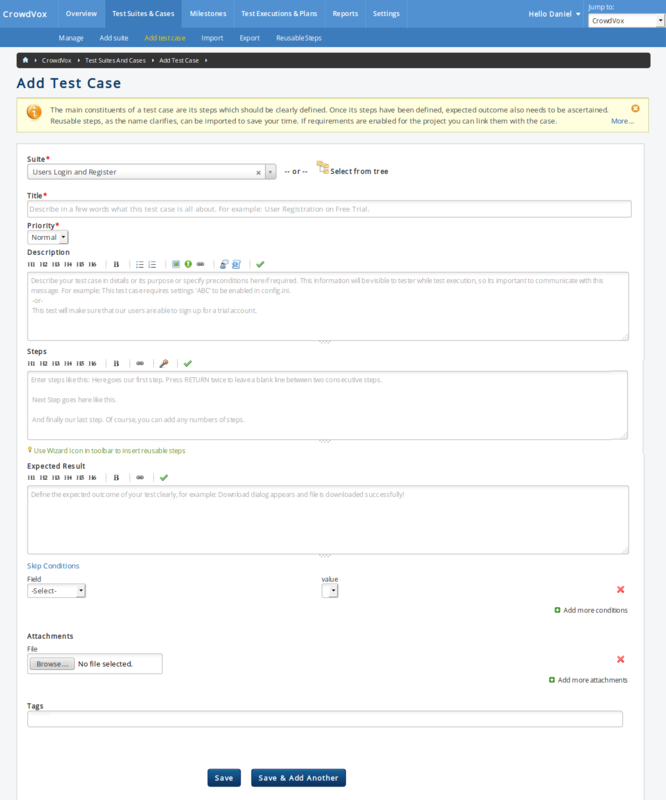 If at the time of adding the project "Separate text fields for steps and expected results" is enabled, then at the time of defining the test cases, instead of a single text field for all steps, separate text fields will be made available for entering individual test steps and their respective expected results, as shown in image below. User has an option to add as many steps as he wants by clicking Add more steps link provided. User can also delete the steps using the Cross button. With version 1.16 of Test Collab comes the feature of ordering the steps. One can now drag and drop a step along with its expected result from one position to the other in steps list. Please note that the feature of reordering of steps would not work when HTML Editor is used as Editor Type for test case steps, expected result and description.